Other than Excel's very popular Auto Filter, we have at our disposal Excel's Advanced Filter. 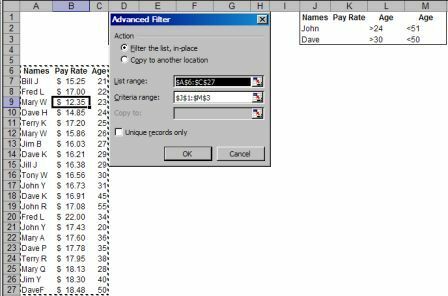 In a nutshell, Excel's Advanced Filter can be used to filter by more than 2 criterion, where Auto Filter has a max of 2! It also has a very nifty feature that allows us to create a list of unique items from a list with repeated data. In addition, we can even use Excel formulas for Excel's Advanced Filter criteria. 1) You list or table must have headings at row 1 of the table. 2) Your data must be laid out directly underneath their appropriate headings. 4) When using Excel formula criteria the cell(s) directly above must NOT have exact copies of the table heading(s). They should be blank, or have a heading that is NOT the same as your table heading(s). 5) If using the "Copy to another location" option you can only copy to the same Worksheet as your original table is located. To copy to another Worksheet you can Start by going to Data>Advanced Filter while on the Worksheet your data should be copied to. 6) To create an OR condition place each criteria in a new cell directly below each other, vertically.